Forward Industries, Inc. was incorporated under the laws of the State of New York and began operations in 1961 as a manufacturer and distributor of specialty and promotional products. We design, market, and distribute carry and protective solutions, primarily for hand held electronic devices, including soft-sided carrying cases, bags, clips, hand straps, protective plates and other accessories made of leather, nylon, vinyl, plastic, PVC and other synthetic materials. Our principal customer market is original equipment manufacturers, or “OEMs” (or the contract manufacturing firms of these OEM customers), that either package our products as accessories “in box” together with their branded product offerings, or sell them through their retail distribution channels. 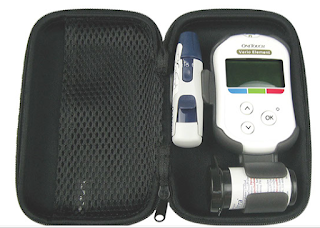 Our OEM products include carrying cases and other accessories for blood glucose monitoring kits and a variety of other portable electronic and non-electronic products (such as sporting and recreational products, bar code scanners, smartphones, GPS and location devices, tablets, firearms and other products). We do not manufacture any of our OEM products and source substantially all of our OEM products from independent suppliers in China. On June 21, 2012, we determined to exit our global retail business (“discontinued operations”) and focus solely on growing our OEM business. Our decision to eliminate the Retail division was primarily driven by the longer than estimated path to bring it to profitability and the strong net sales growth and cost rationalizations in the OEM business. We have substantially completed the exit of our Retail business and have not had, and do not expect to have, any continuing involvement in the Retail business after this date. On March 12, 2012, the Company, entered into a Buying Agency and Supply Agreement...with Forward Industries Asia-Pacific Corporation (f/k/a Seaton Global Corporation), a British Virgin Islands corporation (“Forward China”)...The Agreement, as amended, provides that, upon the terms and subject to the conditions set forth therein, Forward China will act as the Company’s exclusive buying agent and supplier of Products (as defined in the Agreement) in the Asia Pacific region. The Company purchases products at Forward China’s cost and pays a service fee to Forward China. The service fee is calculated at $100,000 monthly plus 4% of “Adjusted Gross Profit.” “Adjusted Gross Profit” is defined as the selling price less the cost from Forward China. Forward Industries (FORD) designs and manufactures cases for various products. The bulk of their revenue, 82% in the most recent quarter, is from sales of diabetic products such as what's shown below. They have 4 major diabetic customers that account for all (or very close to all) of that. The relationship with Forward China is very important to FORD. FORD itself only has about 20 employees including 11 in sales and 3 in design. I asked management about the work split between FORD and Forward China: FORD handles sales and design while Forward China handles manufacturing, sourcing, and quality control. I can see both good and bad here. For one thing it's good to be nimble and focus on what a company can contribute, but on the other hand is seems like FORD is kind of a middle man to a middle man. Forward China sometimes does it's own manufacturing but most products are outsourced. I asked management why customers wouldn't go straight to Forward China and was told it's because they are not focused on design and sales. Forward China wants sales given to them so they can focus only on sourcing and manufacturing. So FORD goes out and finds customers then designs the product and places orders with Forward China who gets the products built and shipped out. Wise is the man at FORD. He founded, and is a principle of, Forward China. He is CEO (and I think still Chairman of the Board) of FORD. He is also a principle and Chairman of "The Justwise Group Limited, which he founded in 1977, a company that specializes in the procurement of consumer durable products from Asia and is an established supplier to a list of major U.K. multi-channel retailers". He has "significant shareholdings in 2 manufacturing plants in China". So he has been sourcing and manufacturing in China for decades. Wise was voted onto the board in 2012. He quickly went to work changing up their China sourcing by setting up Forward China. I don't know how things are now compared to how they were but management tells me the quality and cost are much improved with Forward China over what it used to be. Wise owns 19% of the outstanding shares. His long time business partner, and a managing director of Forward China, Ms Jenny Yu owns 6.73%. Wise is behind the major board shakeup over the past year. There are too many details for me to go through it all in depth but basically he forced out the entire old board and CEO. There's a pretty good write up over on Seeking Alpha with some background. In the summer of 2014 he sued the board for breach of fiduciary duty. The board sued him back. He brought a new complaint seeking a restraining order to keep the company from issuing more preferred stock. The CFO also sued the company for retaliation against a whistle blower, so there were major issues. The company was looking into acquisitions and funding outside of FORD's competency and that triggered Wise to push for change. I think when they wouldn't listen to him he did what he had to do to change the course. Wise nominated a complete new slate of directors and in Dec 2014 at the annual meeting they were all elected. Wise and Yu controlled about 25% of the shares while the former CEO and chairman had only about 5%. In Jan 2015 the old CEO, Garrett, resigned. Due to the change in control, the company had to pay out to retire all the preferred stock. Fast forward to now and Wise is CEO and Chairman of the Board while the board has been expanded to 7 and is filled with his nominees. He is in full control. MRQ had EPS $0.06 due to a one time insurance settlement, it would've been about $0.01 without that. clean share structure with 8.4M shares out. No preferred, no warrants. There have been some huge share price swings recently. In August when the Q3 results were released the share price just about tripled but came down once people realized an insurance settlement was the driver of the earnings. At the end of August share price more than doubled again when FORD announced they had signed an extension agreement with Bayer, one of their 4 major diabetic customers. That is the question. We have a company attempting to turn around that has gone through major changes. The company is now run by a man with many years of experience in the field. The CEO is highly invested. He thought enough of the company to force out the entire board and take over. Revenue has been growing but they haven't been able to get over the hump of earnings. I asked the company about their competitive advantage. They said number 1 is experience with the high end medical products. Also their quality and fast response time with volume orders. I am not convinced that they have much of a moat as it seems like commodity products to me. There would be switching costs for their big diabetic customers but I doubt FORD holds much pricing power. The most interesting thing that came from my conversation with management was their thoughts on the future. Priority #1 is retaining their big customers. Next is right sizing the company and moving into markets outside of medical. The interesting thing was talk of being able to manufacture anything, not just electronic devices. They said they could find any customer currently manufacturing product in an expensive environment that wants to shift manufacturing into Asia. FORD could manufacture anything: computers, scooters, toys, clothes, whatever. It doesn't matter what the product is, so the market is huge. It sounds like FORD plans on being a sales channel for Asian manufacturing in the US. This is their core competency and I'd say they have the right person running the show. As I've been told, "Here's where the gamble and belief and logic collide." "In addition to our investments to grow and diversify our business organically, we are beginning an active search process to identify potential acquisition targets that would be complementary to our existing business and allow us to further leverage our operating infrastructure. We anticipate that this search process will be ongoing with the goal of identifying prospective target companies that, if acquired, would be accretive to our organic results." "We also believe that these investments are expanding our ability to provide innovative and differentiated solutions to our existing and prospective customers. As an example, the diabetic products sector seems to be undergoing significant changes that, we believe, present us with meaningful opportunities if managed proactively." Any updates to this one? They had a big acquisition recently. Stock spiked way up and I sold out. It has come down and I plan to buy back in.